← Wingsland S6 scene still alive? Just a warning out there to watch out for cracks, when using fairy drone props and spacers. The spacers are plastic and they are not a 100% fit as they seem a couple thou smaller in the spacing. 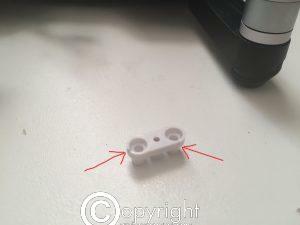 This means the legs of the plastic spacers gets squashed in a bit. You can tell this when one or more of the props do not move freely. Also because of this one or more of the props also wont be as balanced. I think a better solution to this is to use the original Wingsland metal spacers and find some collets that fit the original screws , so the fairy drone props fit that way. Because by the looks of it these plastic spacers are going to fracture under the stress, and will be a big problem if in the air when these give up the ghost. Also as these spacers are plastic and the tolerances in manufacture , some might fit better than others? This entry was posted in Radio Control Models, Wingsland S6 and tagged fairy drone spacers cracks, Wingsland S6 mods, Wingsland S6 spacers, Wingsland S6 spacers cracks. Bookmark the permalink.